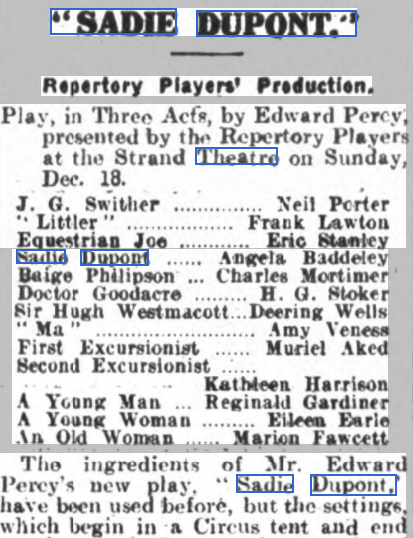 The Stage - 22 December 1927. The Strand Theatre, London. "...and the hulking bully, the impresario, the doctor, Sir Hugh, 'Ma', and the gentle Mrs Brown, (with sweet tones more like those of Wessex than of Sussex) were all played excellently by Mr Eric Stanley, Mr Charles Mortimer, Mr H.G. Stoker, Mr Deering Wells, Miss Amy Veness, and Miss Marion Fawcett." 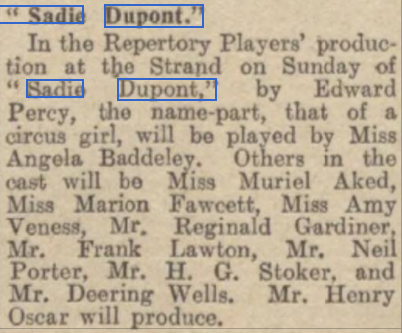 Charles Mortimer was in the cast of "Sadie Dupont", playing Baige Philipson at the Strand Theatre, London, in 1927. This took place on 18 December and was a single performance. The cast also included Frank Lawton and Angela Baddeley. From The Era of 15 December, 1927. From The Era of 21 December, 1927. A Play, in Three Acts, by Edward Percy; presented by the Repertory Players at the Strand Theatre on Sunday, Dec. 18. 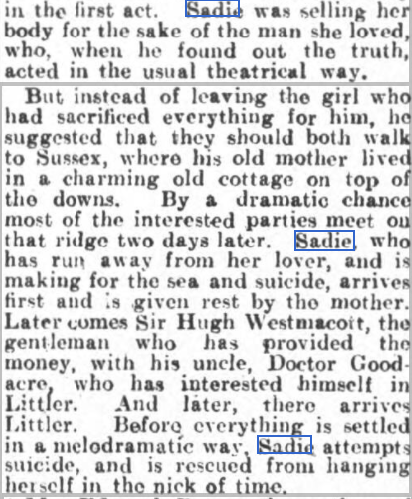 The ingredients of Mr Edward Percy’s new play, ‘‘ Sadie Dupont," have been used before, but settings, which begin in a circus tent and end on the South Downs, give an air of novelty to the piece. 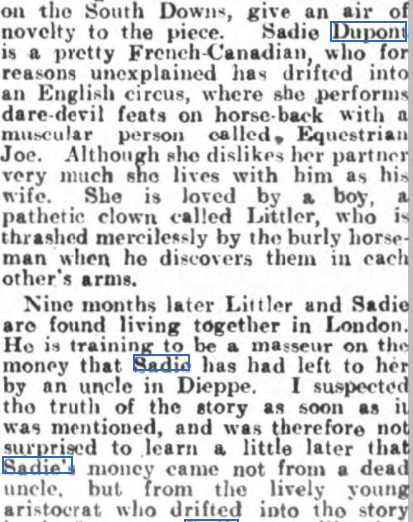 Sadie Dupont is a pretty French-Canadian, who for reasons unexplained has drifted into English circus, where she performs dare-devil feats on horse back with a muscular person called Equestrian Joe. Although she dislikes her partner very much she lives with him as his wife. She is loved by a boy, a pathetic clown called Littler, who is thrashed mercilessly by the burly horseman when he discovers them in each other’s arms. Nine months later Littler and Sadie are found living together in London. He is training to be a masseur on the money that Sadie has had left to her by an uncle in Dieppe. I suspected the truth of the story soon as it was mentioned, and was therefore not surprised to learn a little later that Sadie’s money came not from a dead uncle, but from the lively young aristocrat who drifted into the story in the first act. Sadie was selling her body for the sake of the man she loved, who, when lie found out the truth, acted the usual theatrical way. But instead of leaving the girl who had sacrificed everything for him, he suggested that they should both walk to Sussex, where his old mother lived in charming old cottage on top of the downs. \By a dramatic chance most of the interested parties meet on that ridge two days later. Sadie, who has run away from her lover, and is making for the sea and suicide, arrives first and is given rest by the mother. Later comes Sir Hugh Westmacott, the gentleman who has provided the money, with his uncle, Doctor Goodacre, who has interested himself in Littler. And later, there arrives Littler. Before everything is settled in a melodramatic way, Sadie attempts suicide, and is rescued from hanging herself in the nick of time. Mr. Edward Percy, the author of "If Four Walls Told,” is capable of writing better plays than the one presented by the Repertory Players on Sunday night. 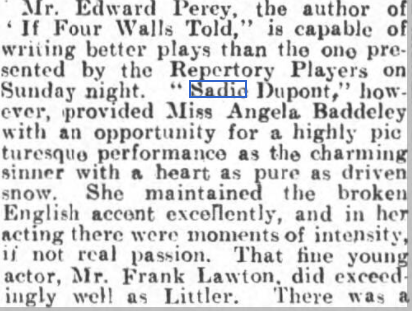 Sadie Dupont,” however, provided Miss Angela Baddeley with opportunity for a highly picturesque performance as the charming sinner with a heart pure as driven snow. She maintained the broken English accent excellently, and in her acting there were moments of intensity, if not real passion. 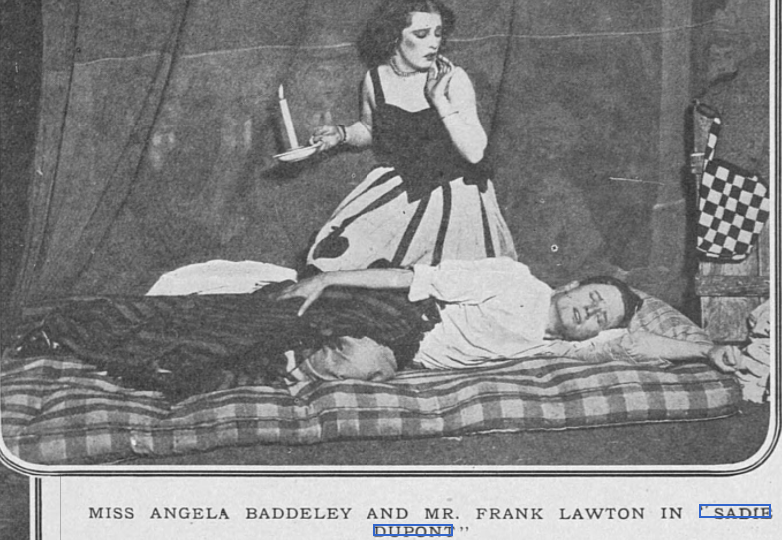 That fine young actor, Mr. Frank Lawton, did exceedingly well as Littler. There was a natural beauty about his presentation of the boy, and made his effects with restraint. Mr. Deering Wells made a good-natured creature of the aristocratic lover, and Mr. H.G Stoker was excellent as the doctor. A neat study of the clown who had drifted into the business from Eton and Balliol through gin and barmaids came from Mr. Neil Porter. Mr. Eric Stanley made muscular creature of Equestrian Joe, Miss Amy Veness gave another of her remarkable character studies as the landlady in the London lodgings, and Miss Marion Fawcett appeared to great advantage in the delightful part of the Sussex woman in the last scene. A Hebraio gentleman was well acted by Mr. Chas. Mortimer, and various excursionists (dragged as padding into the play were nicely handled by Miss Muriel Aked, Kathleen Harrison, Mr. Reginald Gardiner and Miss Eileen Earle. The play was cleverly produced by Mr. Henry Oscar. From The Tatler - Wednesday 28 December 1927.